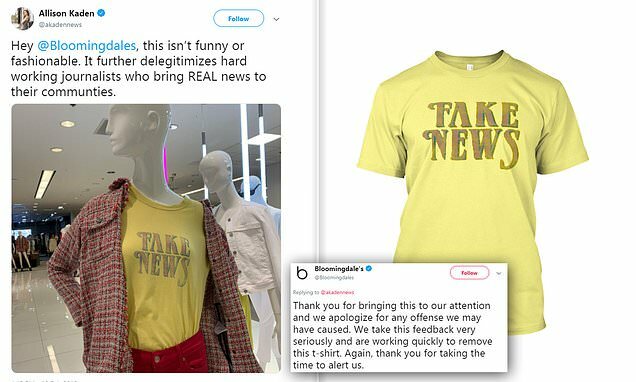 Bloomingdale's has apologized for 'distressing' anyone who came across a 'Fake News' T-shirt being sold at the department store, insisting it didn't mean to 'offend' anyone with the motif. The Monday apology followed a complaint via Twitter that scalded the store for selling a yellow top using the phrase President Donald Trump has used to label negative news about himself. 'Hey @Bloomingdales, this isn't funny or fashionable. It further delegitimizes hard working journalists who bring REAL news to their communities,' a Pix11 reporter wrote Sunday. The brand responded saying they planned to remove the clothing design – which comes in various colors and styles elsewhere online ranging $18 to $38.99. While journalist Allison Kaden spotted it in a White Plains, New York store, it's unclear exactly how many others it was distributed to but Bloomingdale's said there were 'a few'. But the apology wasn't enough for some people. Bloomingdale's decision to remove the shirt sparked outrage in others with one writing 'shame on you'.